The end of summer nears. The neighbor's cherry orchard is changing to reflect the season with leaves on the trees turning a beautiful golden color. Although the sun is going down more than an hour earlier than it did during mid-summer, the days are enjoyable and pleasant. Cooler weather in the 80's is giving the rose bushes a second wind and they are bursting forth in beautiful, colorful blossoms. It's like one last fling before autumn finally arrives. It's the time of year to pack in as many things as you can before the weather turns cold. Perhaps it's time to take a picnic lunch to the park. Or to drive to the mountains on a wildlife scouting trip. It is harvest season. Have you picked enough boxes of peaches and apples to satisfy your sweet tooth? And what about tomato sandwiches? Have you enjoyed enough of them to appreciate their yummy goodness? Take on the days and enjoy the last fleeting days of summer sun! What's on your schedule for this week-end? Photo: Alma's neighbor shared a set of six beautiful Turkish nut bowls and they now grace my kitchen cupboard. I think they are very cute! Neighbor is a delightful English woman who knows the value of a perfectly made cup of tea. She's married to a Turkish gentleman whose family visits from Turkey each year. Together they are a hospitable team. I appreciate the gracious hospitality they have extended to me. Sounds like you have an abundance of fruits and garden delights! Love the nut bowls and thanks for sharing them with "Open House"! Love the bowls and your photo of them. What a gracious lady she is to know who would appreciate them. 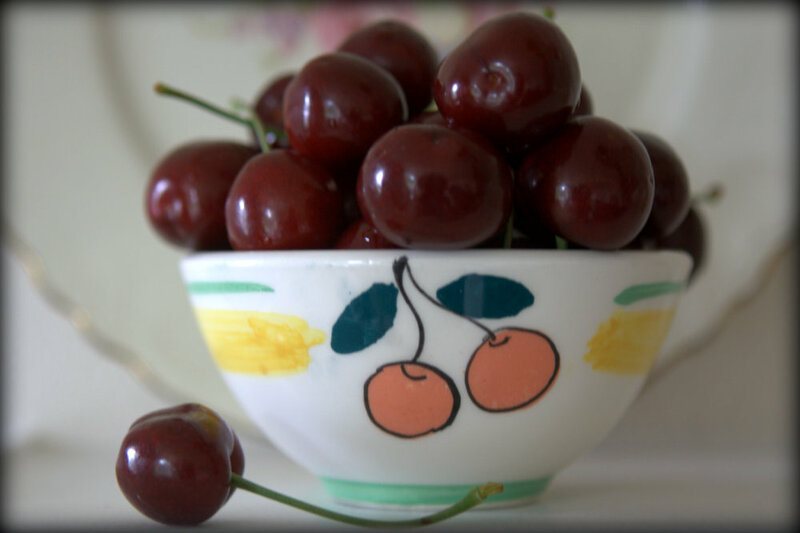 Mmmmm. . .sweet cherries in pretty Turkish Nut Bowls! Makes my mouth almost taste them.